RevK®'s rants: What's my name? I have long understood that, in the UK, your name is whatever name you are known by. I would be interested in credible references from anyone on this, either way. Basically, that we have no formal legal notion that we all have a single official name that we must always use, or that we have a single legal name. Now I know about using a deed poll, which is a statement to the world renouncing a previous name and stating you will only use a new name. Even so, this is not something that is official or registered or anything - it is a statement you make yourself in writing (on paper with straight edges). To convince people (banks, etc) that it is a valid thing, you usually want a printed and even sealed one, but in principle you could just hand write it in crayon and it means the same thing. I think a lot of people in the UK think that people do have an official name and even that a deed poll is some sort of official document. The one thing that does matter, as I understand it, is that you don't use different names for fraudulent reasons. But you can be any name you like, and I think you can even be different names in different contexts. I know loads of people that "go by" their middle name, and lots of people that use a name that is an abbreviation of their original name, e.g. Jim. Well, I have used some aliases. This has not really come about by some desire to be covert or difficult, it just sort of happened. I have aliases in various contexts because of the way things work - e.g. you have a "handle" on things like irc and I am "RevK". I am "RevK" on a few World of Warcraft realms too. I am known to some as "The Reverend". 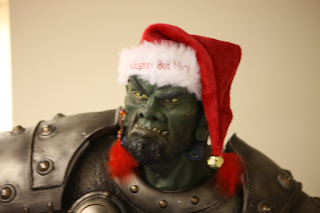 Having been given an orc by a customer, I also ended up being known as Thrall Horde because we set up facebook account in that name, and that has been kind of adopted by myself. Anyway, there have been a couple of cases recently where the question of a person's name has come up. One is Nominet me.uk domains that have to be registered to an individual. I have one registered to me where I am using the name Thrall Horde. I think that is valid. It is me, and I am not hiding that fact (not fraudulent). There are people that know me by that name, and some may only know me by that name. Another case is RIPE getting confused by the notion that people can have any name they choose. They want your "official" name when applying for PI space and fail to understand the idea that we don't have "official" names in the UK. From what I can tell there are countries where people do have a single "official name", probably countries that do have ID cards, which we don't, yet. So, am I right? Am I legally allowed to call myself anything I want for non fraudulent purposes? Or is there one true official name that I have? If the latter, how is it that a simple self declaration like a deed poll is good enough to change my name for passport, driving licence, bank account, etc.? I am pretty sure of the idea of having any name I want, but less sure that I can have more than one name in use in different contexts at the same time. I really don't know, and my googling is not getting me the answers. Update: Some interesting references. It looks like there was once a restriction on changing a Christian name (from baptism) but that being generally not the case now, and in general one can simply adopt a name - its a matter of providing evidence that you have done so in some cases for some purposes. Some rulings seem to suggest a man cannot have two names at once but it seems also recognised that many people (particularly actors) do just that. It seems even the passport office will place an "observation" that someone is also known as stage name. Perhaps I should make Thrall Horde my stage name and get a note on my passport :-) The key thing is that a name is simply a (non unique) means to help identify an actual person - and if the name does that, and is not used for fraud, then it is your name! Update: Nice article on names and computer systems. Something I've wondered for a while now - why Revk or The Reverend. Is it officially religious or another one of your grey areas? Formally ordained with ulc.org - I am as much a reverend as any other, just that my training involved the ability to fill a form in on a web page. It seems to me that pretending to be someone you're not is potentially fraud, however simply using lots of names to refer to yourself is not a problem. Everyone is known by different names at different times in their lives - they're all valid. I had a similar issue with StartSSL - they wouldn't let me verify with my real name because that's not what's on my driving license (I'm known by, and don't answer to 'Anthony'. It was what got written down on the birth certificate when I was born - to the objections of my parents at the time - and it's a name that exists only on certain government documents.. but it is *not* my name at all). So when you apply for official documents, what name do you give? For example, when applying for a passport or driving license they usually want a birth certificate as proof of name. So does that then become your official name? Could I get a passport in another name if I so wanted? So the problem here is that we (usually) have a birth certificate which has a name on it. Oooh, using birth certificate is not a good one at all - and sexist as far more women change their surname than men. The UK has no legal concept of an "official" name. However, the UK does have a concept of "name by which you are known to the government", which is (with a very few exceptions) the name on your passport and driving licence. And, while you are entitled to call yourself whatever you like, that's not the same as having the right to insist that everyone else calls you by that name. If you are entering into a contract with someone, they are perfectly entitled to make it condition of that contract that you do so under the same name as appears on government-issued documents. Interesting - though not everyone has a driving licence, passport, or so on. Also, if, for example you have used a deed poll, surely you have a right under the Data Protection Act for people to have correct personal data on you so you do have a right to be "called by" a new name. Well, to be slightly more accurate, the one name that you do always have the right to insist on being called is the one by which the government knows you. But you can't insist on being called whatever arbitrary name you choose. (Sorry about the double posting, by the way - I thought I'd cocked it up because the login didn't seem to work, so I rewrote it). The DPA has to add to this I expect... But at least the consensus here is that you can use any name you like in principle. The UK has no concept of an "official" name. But it does have a principle that there is usually only one name by which you are known to the government, and that's the name which (with a very few exceptions) appears on things like your passport and driving licence. You can choose what that name is (it defaults to the one on your birth certificate, but there's no law which says you have to keep it), but you can't usually choose to have different names for different government purposes. So, while you can call yourself whatever you like, that doesn't extend to the right to insist that everyone else calls you by the same name. If you're entering into a contract with someone, they are perfectly entitled to make it a condition of that contract that you identify yourself to them with the same name that appears on government-issued documents. And that's what RIPE, Google, Nominet, etc mean by your "real" name. It may be what they intend by "real" name, but is it wrong in any way to tell them that my "real" name is "Thrall Horde" if I am not defrauding them? Depends on exactly how the contract is worded. Quite right. You have the right in common law to be known by any name you wish. You can have many of them and all are legally permissible provided they aren't used for the purposes of committing fraud (e.g. pretending to be *the* Terry Wogan). Many official forms make reference to this. Go ask at a police station. Your average copper will be very familiar with the concept. Proving you are known by that name is more difficult and there are all sorts of reasons its a valid question. As you say the usual form wording of a deed poll renounces all use of a previous name, is sworn in front of a commissioner for oaths or solicitor, witnessed, and, crucially, Gazetted. for which there is a cost. But it is taken to mean this is your common name and definitively proves it. You don't need a Deed Poll to get a passport or driving licence in a different name (you're only allowed one passport), but its a damn sight easier with one. Many banks have a process which merely involve a delcaration that the change of name is not for fraudulent processes but you often have to speak to the right person. Most commonly one half of a newly-married couple does it regularly. Conversely, you don't necessarily have the right to use multiple names in transacting business. A business can address you how it wants as long as it is clear it's you and not offensive. It might refer to you by a number rather than a name. So you can't stamp your feet and insist we all refer to you as Mary Queen of Scots. Though you could sign a document in that name. It's your problem if it doesn't match up to computer records with an organization that knew you as Jock Strap previously. You have to give them a reasonable chance of identifying you. Indeed it's potentially evidence of fraud if you benefit from the confusion. "What is your name", "What are you called" and "what would you like us to address you by" are subtly different questions. The first two imply history and establishment of a name, nothing more, but making up a name on the fly is probably not correct. I took a friend through the process a few years ago, and we used a book which I still have called something simple like "Change of Name" published by Pearson, I think. It had all this stuff in it. I might still have it if it's out of print. I'm sure there are other authorities. And what I said was from memory, I don't have it in front of me. Ah, excellent, and a real book as a refenence sounds worth pursuing... Thanks. I thought Birth Certificates defined your name due to the fact that new born children must be registered within a certain time period and on the certificate a name is mandatory. That would be a bummer for all those women that change their name when they get married. So hang on.. Tony seems to have a driving license with a differant name that his birth certificate. How did you do that Tony? I thought you had to submit a birth cert as proof of, errm, name I guess, when you apply? A birth certificate is usually proof of identity and nationality, not of name. The theory, I guess, being you can't get a birth certificate for someone still living unless you (say you) are that person or have power of attorney. There is no definitive proof of name; legally it's usually established through evidence. 'Evidence' is not the same thing as 'proof'. I think what this all boils down to is the answer to the question of Rev's 'Real Name'. There isn't one definitive answer to that. Any name he can provide evidence of (should it be challenged) is 'real'. Usually an organization wants to know your name to establish who the contract is with; in which case there are merely asking for a label that identifies you. It is almost never unique - at least not on its own. It's just a label for convenience of the contract. This name 'label' has no legal significance other than as evidence of identity. For many years my passport showed a different name to that on my driving licence and National Insurance record. For simplicity, I have since changed my passport to match the other documents, though some people still address me by my other (birth) name. The different names came about after my parents' divorce - I was enrolled at school under my step-father's surname. Pretty hurtful to my father, I believe. Sometimes, a person's "known by" name is not, at least in the opinion of some people, obviously related to their "real" name. The musician, Kit Hesketh-Harvey, was once refused travel by an airline until he got his ticket amended to read "Christopher" rather than "Kit", in order to match his passport. It was a flight leaving the UK, going elsewhere in the EU, or possibly internal to the UK. I can't read Tom's link as it's "taking too long to respond" at the moment, but I would be interested to see what it has to say.